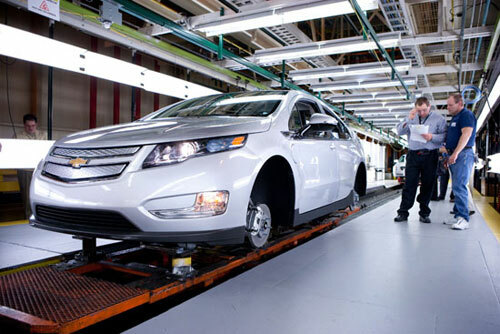 Chevy Volt Inches Closer To Production | OhGizmo! Remember back in 2007 when the Chevy Volt was just a wicked looking concept car with the same sort of “sure, we’re going to be producing this in the next 3-5 years” dreams as many other concepts? There have been some changes along the way, certainly, but there are now Volts coming off the assembly lines at GM factories. These particular cars are called “pre-production” since they’ll be tested to make sure the production process is up to snuff, but for all practical purposes, GM is actually producing Volts now, and I for one am impressed. It remains to be seen, I suppose, whether or not I will remain impressed when GM announces the final pricing for the Volt, which I’m guessing will be a little bit too close to $40,000. They seem to be on track for a late 2010 commercial release, and hopefully production will be such that the non rich and famous like you will be able to buy one in a dealership by early 2011. Me, I’m famous (I write for OhGizmo), so I’m pretty sure they’ll be sending me one for free. But why would you want one of these cars? Not really. The claim is 40 miles on battery alone, in ideal conditions. As anyone who has been born knows, Ideal conditions don’t happen. More realistically you will get half that mileage, 20 miles. This sounds good until you realize that the average American commuter just going between home and work travels 26 miles or more. After the battery runs dry you are stuck with a car that suffers a severe cut in power because the generator that charges the batteries is, at last data release I saw, insufficient to fully power the motors, let alone charge the batteries. This means heavy fuel inefficiency. Aesthetics are a rather personal matter, but in general the Volt looks a lot like most other cars of similar passenger capacity and door count. that is to say, unexceptional and undistinguished. More worryingly it looks rather not aerodynamic, which also cuts into its fuel efficiency. 3. It will save you money? Over the life of the car, not very likely, unless the release price undercuts the Toyota Prius significantly. The Prius itself is still too expensive to really save you money as well. 4. It will save the environment? Only if you drive less than 20 miles both ways to work, the store, etc. on a daily basis, and if the battery is non-toxic. Supposedly the Volt uses a large Lithium Ion battery, which is non-toxic, if it is produced in the US or Europe. In other countries some rather horrifying industrial practices will throw the ball into the toxic court. Even if these conditions are met it still will not be significantly better for the environment than any other fuel efficient car. Instead of buying a Volt, save some money and hassle, buy a diesel car. Run it off bio-fuel made from restaurant waste oil. You will probably get equal or better mileage, still be at a net CO2 drop, and get the delightful smell of Tacos from your exhaust. Seems the “Leaf” will be cheaper and outperform the Volt. Don't be surprised if it outsells the Volt as well. Seems you'll be able to lease a Leaf for a little over $300 a month. So you want a car that charges a premium so heavy that any savings in fuel it generates are not recovered in comparison to the premium. You want a car that under “Ideal” conditions can go 40 miles and not use a drop of fuel. You want a car that looks a hell of a lot like every other car with the same number of doors and passengers. The the Chevy Volt is ideal for you. Keep in mind that Ideal conditions don't exist, most cars are ugly, uninspired hateful things, and that $40,000 base price will almost buy you two Toyota Prius. You also want a car that under real world conditions will probably only go 20 miles on battery power alone, knowing full well that the average owner drives at least 26 miles on any given day. You want a hybrid car that has a generator instead of a gas engine backup, a generator that at last check can only provide half the power the electric motors that drive your car need. You want the legendary quality, customer service, and brand reliability of GM. Again, the Chevy Volt is for you, a person that is willing to accept a poorly conceived and developed car from a company that is legendary for its ability to go bankrupt and not care one small bit for its customers beyond the bare minimum it needs to sell product. The the Chevy Volt is ideal for you. Keep in mind that Ideal conditions don't exist, most cars of this sort are ugly, uninspired hateful things, and it comes with a base price that will almost buy you two Toyota Prius a comparable and probably better vehicle. You also want a car that under real world conditions will probably only go 20 miles on battery power alone, knowing full well that the average car owner drives at least 26 miles on any given day. And to think I just bought my car. LOL nah, I love my Jetta. According to the official site, it looks like a 10NOV2010 launch. I can't wait to see this car released in the market.